Over the past year, we’ve introduced new business programs, launched eCommerce accessible reports and worked for our ISO 27001 certification. We’ve also made several upgrades to our physical space and got up to all kinds of initiatives and events that made the year really fly by. We figured we would share a synopsis of 2018 as we saw it – feel free to scan through the Insightrix 2018 Year in Review. Throughout 2018, Insightrix Research invested a great deal of capital and worked tirelessly with the International Organization for Standardization (ISO) in pursuit of obtaining ISO 27001 certification. And we are only months away from completing the process. This international certification means Insightrix will distinguish itself as having some of the most stringent information security management systems (ISMS) available anywhere. ISO 27001 certification goes beyond regular IT and data management security. It covers all aspects of information security and data management in our organization. Whether it is raw data, paperwork or even the physical space of the Insightrix offices, ISO 27001 certification means our clients can be assured their data and information is safe and protected. Securing ISO 27001 certification in 2019 will bring Insightrix ISMS closely in line with recent EU GDPR requirements and will set Insightrix apart in the national and international marketplace as a leader in information asset and data security. In early 2018, we launched Insightrix AdCheck – a new and innovative way of pre-testing advertisement creative. Suitable for individual ads or multi-media campaigns, AdCheck is the most comprehensive tool for assessing, predicting and optimizing the performance of advertising copy and creative. Insightrix AdCheck is a quantitative pre-testing solution that uses standardized copy-testing measures based on a battery of questions. With AdCheck, we can help execute ad testing projects quickly and build industry norms – all with metrics that are both easy to understand and to act on. In April 2018, we added an eCommerce storefront to the Insightrix website. Now, clients and those interested in purchasing our syndicated reports can conveniently access them directly though the website powered by Stripe. The 2018 Saskatchewan Social Media Report offers in-depth and representative analysis of social media habits and perceptions across devices and platforms. The Saskatchewan Media Democracy Report digs into device usage behaviours, media consumption habits, views on advertising, the online shopping behaviours of Saskatchewan residents and more. Both reports are quickly becoming recognized as an indispensable tool for targeted marketing intelligence in the Saskatchewan marketplace. We’ve strengthened our already robust SaskWatch Research® member profiling system. We’ve added more and even deeper categories to ensure our clients get to consult the niche groups they need to engage with most. We’ve added specific profile categories and subcategories. These speak to general interests and spending habits, residency and newcomer status, specific occupations and distinct sub-fields of employment or activity and a whole lot more. By adding these categories, we can probe even deeper and be incredibly specific to choose the exact participants you need for your study. This provides actionable research that speaks precisely to your unique question. With these changes, we continue to provide the most accurate and relevant market intelligence about Saskatchewan possible. 2018 was a year of team effort and client partnership at Insightrix Communities. As part of our commitment to providing the best customer service available, we’ve worked with our clients to develop a user experience that is second to none for the Insightrix Communities software – the only all-inclusive market research online community (MROC) platform available. By adopting an international focus in 2018 and through consultation with existing and prospective clients, we’ve tailored our MROC to be the most robust and worry-free online panel anywhere. In early 2018, Insightrix implemented several office upgrades and enhancements to amenities in our focus group rental facilities and meeting rooms, including connectivity and multimedia display capabilities. With these upgrades now in place, Insightrix is now able to offer the highest-quality focus group spaces available in the province. Stories of Market Research: The Insightrix Podcast got its legs under it in 2018 and really hit its stride. What follows are the episodes of Stories of Market Research: The Insightrix Podcast we produced in 2018. Check out the links below to see just some of our publications from 2018. Why Should Marketers Do Ad Testing? 2018 was an action-packed year for Insightrix and our staff. From fundraising to staff outings, we were hopping all the way through the year. 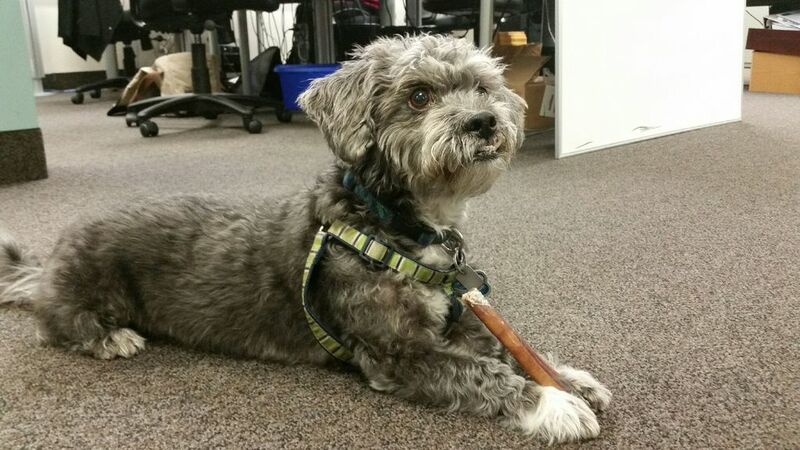 CMO, Chief of Security and all-around good boy, Presley, enjoys a well-deserved treat. Early in 2018, our Chief Morale Officer and Head of Security (and beloved office dog), Presley, had to undergo back surgery – no small or easy feat for a pooch of his years. We are happy to report that he bounced back after a short convalescence and has since returned to his position of facilitating noggin scratches and guarding the front door. Near the end of April, Insightrix CEO, Corrin Harper, presented a study by Insightrix that profiled the non-profit sector in Saskatchewan on behalf of the Saskatchewan Nonprofit Partnership – the first of its kind ever. The study outlined the non-profit and not-for-profit sector in Saskatchewan. It included some of the challenges these organizations face and the research requirements that both for-profit and non-profit businesses share. Data for Good are a Canadian organization who volunteer their data science expertise to help non-profit organizations. They provide services like sector profiling, employee engagement studies, data gathering and processing, reporting and more. Throughout 2018, Insightrix worked with the Saskatoon SPCA on a series of projects. We also engaged in several internal fundraising initiatives to benefit the Saskatoon SPCA. Through working together with their organization, Insightrix and the Saskatoon SPCA were able to benefit a great deal through many joint marketing initiatives, research projects and more. You can watch Insightrix President, Corrin Harper, and Saskatoon SPCA Executive Director, Patricia Cameron, discuss how both organizations worked together in our new video, “Insightrix – Pawsitively Making Changes”. A cheery (and slightly damp) team gets set to participate in the Saskatoon SPCA Night to Howl. 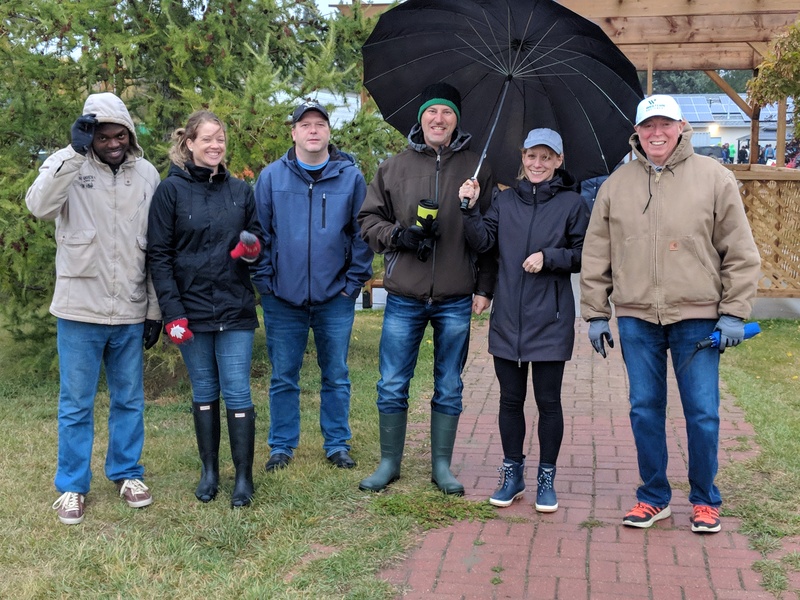 A big part of the corporate culture at Insightrix is about giving back to the community we serve. One of the ways we do this is by raising funds for organizations that are chosen by our own staff. 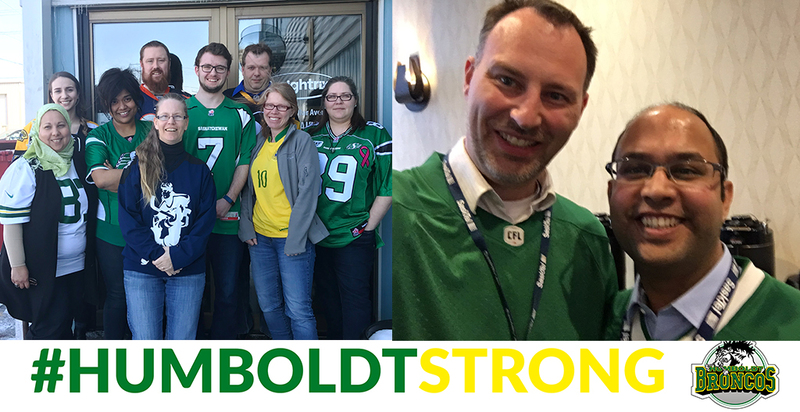 In April of 2018, all of Saskatchewan and the rest of the country were devastated by the news of the tragic bus accident involving the Humboldt Broncos. While the Saskatchewan community pulled together to help the survivors of the accident and their families, Insightrix did its part by donating $1,000 to the Broncos’ GoFundMe campaign, as well as making a $1,000 donation to help the first responders who attended to the scene of the accident. 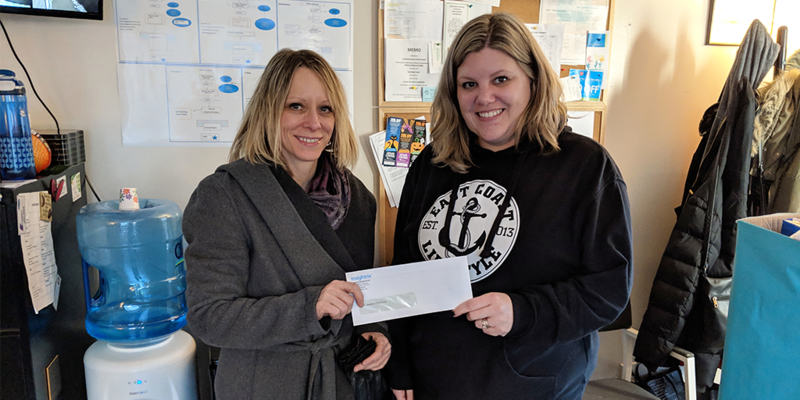 Corrin (Left) drops off donations raised by Insightrix staff at Saskatoon Interval House. To help show they stood with the survivors of this tragedy, Insightrix staff donned their jerseys and took to social media to show their support. Over the Holiday Season, the whole Insightrix community pitched in and raised over $1000 in funds and personal products to be donated to Saskatoon Interval House – an emergency women’s and children’s shelter in Saskatoon. During the past two years in December, we’ve sponsored the adoption of 10 of the most hard-luck animals at a Saskatchewan animal shelter in the hope that they’ll find a home for the holidays. We call these animals “The Insightrix 10”. This year, we sponsored the adoption of 4 dogs and 6 cats at the Battlefords Humane Society, covering all adoption fees for whomever could give them a stable, loving home. As you’ve seen, 2018 was a busy and successful year at Insightrix Research and 2019 is shaping up to be even better. Beyond continuing to apply innovative approaches to provide custom research solutions for our clients, we look forward to completing our ISO 27001 certification early in 2019, rolling out a whole new season of Stories of Market Research: The Insightrix Podcast, conducting polls and surveys about national and local stories of interest and remaining a provider of the highest quality research and reporting available anywhere.